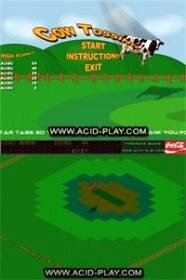 This is a very good game for you to play, when all you feel like doing is throwing a cow around. The controls are easy enough to master [unless you are an Ian, who appears to be ‘mouse handicapped’] and it is easy to get into. O.K. The first rule of cow tossing is that you do not ask what the point of cow tossing is. You simply have to throw a cow onto a bull’s-eye and are awarded points according to where the cow lands on the target. I like the applause you get when you hit the target. There are no bugs in this game as it has undergone many many bug catching tests. I suggest that you download this game. At first I was thrown a bit by the way you must use the mouse. One must develop a quick motion with the wrist and at the same time a certain amount of speed in order to achieve the main goal of a bulls eye. After playing for a few minutes I found myself engrossed; concentrating on my hand movement and speed to get the highest score possible forgetting all else! I downloaded it and look forward to playing with my teenager. I am a 48 year old grandmother who loves a clean & fun game like Cow Tossing, and I look forward to seeing the look on my daughters face! This is a very easy game to play and is so much fun just tossing around a cow! If you want an easy game to play, this is it! I like the applause you get when you hit the targets. And, if you toss the cow too far or too short, it will come right back to the starting point. I suggest downloading this game. Pointless but really fun. You will always want to come back and beat your last score. No gliches. It's the best made and all-around most fun freeware game I have ever played... need I say more? The very best in cow throwing. If you like the classics download this one for sure. 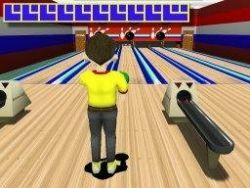 An addictive game with cool sound effects!